Hi guys, I am building a workshop in my garden and have built three walls from concrete garage sections but unfortunately some of the panels were damaged leaving me short a few pieces for the front wall including one corner piece. 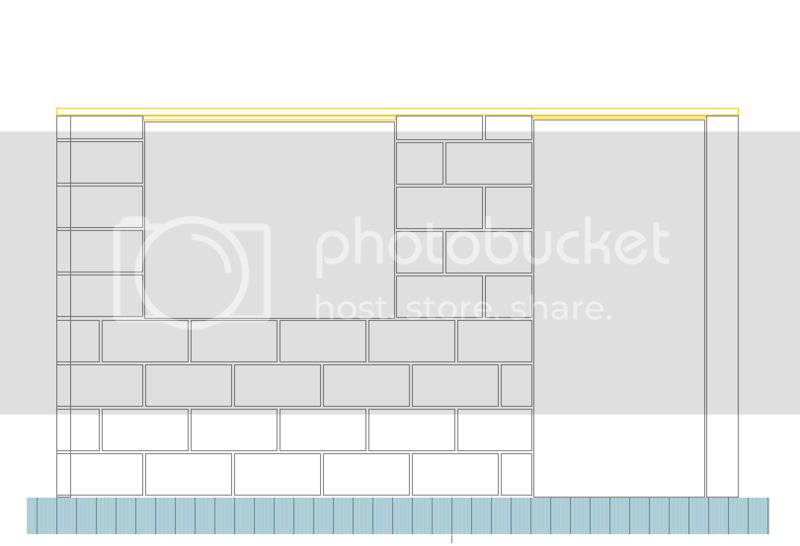 I have a upvc door and window for the front wall and am now intending to use 140mm aerated blocks for the front wall as the weight will be fairly close to the concrete sections the base was poured for but I’m having trouble finding a supplier for the 140mm blocks. I can get 100mm blocks without a problem just not the 140mm. This is the plan I have for laying the blocks. Will this be strong enough with 100mm blocks or with 140mm blocks for that matter? To the right of the door is a concrete corner piece which the door will be screwed to, the block wall will be tied to the concrete panel on the left with 8mm threaded rod bent 90deg bedded into the mortar at every second course and bolted threw the panel. There will also be a wooden batten along the top of all the walls screwed onto the panels. Hi guys, can anyone help me with this please. I guess what I'm asking is will this wall be stable if built with 100mm or 140mm blocks or will I need piers to support it. Don't wort about the strenth of the aerated blocks, would it be ok with standard concrete blocks? Is a single skin boundry wall safe?